Alright folks, we got us some burger stuff to cover. 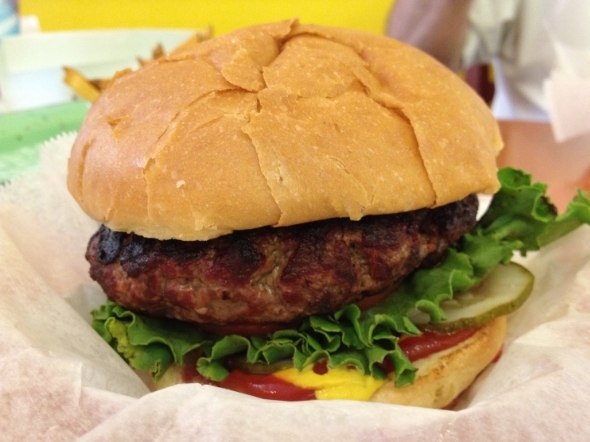 There’s a good chance that the burger pictured above could be one of the top ten food items ever to touch my lips. Certainly a top two burger, but I’m also ready to group this with all-time great things like Lou Malnati’s sausage pizza, G’s mussels, Don Pan’s pandebono, mom’s Mrs. Field’s knockoff cookies, and my sister’s frosting… You get my drift? This is the real thing folks. I’m not messing round. It’s from Edzo’s in Evanston and it was a joyous experience. The only other burger in town I would even include in the same tier is the one from Tavish, but it’s been a few years since I’ve tasted it so it’s a difficult comparison to make. We aren’t going there. About a month ago my buddy saw Edzo’s on Check Please! and he immediately started planning a visit. Yeah, we go on burger dates every so often, is that weird? So one Saturday morning after playing golf at Winnetka we made a quick detour to downtown Evanston for a burger. It was a huge sensory experience packed in to about five hours: great golf and a great burger, all behind me by 11:30am. Wow. Just wow. I had the eight ounce Char Burger, medium, “with everything” and a shake. I was positively giddy waiting for it and it didn’t disappoint. “Everything” is mustard, ketchup, lettuce, tomato, pickle, and onion (I don’t customize anyone’s condiment stack, I usually just say “everything”). I don’t think there are any exotic meats like brisket or short rib in the burger, it just seemed like a secret combo of ground beef and spices. I love simple. You can certainly tell it was hand-packed, plenty of nooks, crannies, and randomness. And there was virtually no lower bun saturation yet it was juicy. I think they achieved this by using the condiment stack as a juice barrier. The bun is soft and compresses perfectly without losing any of it’s bunness, allowing even small-mouthed people to shovel in the thick burger and a full condiment stack with very little mess. They may have went slightly past medium on mine but not much. It tasted great, near perfect. The menu is simply awesome. Behold the solid food portion of the menu. Just behold it. 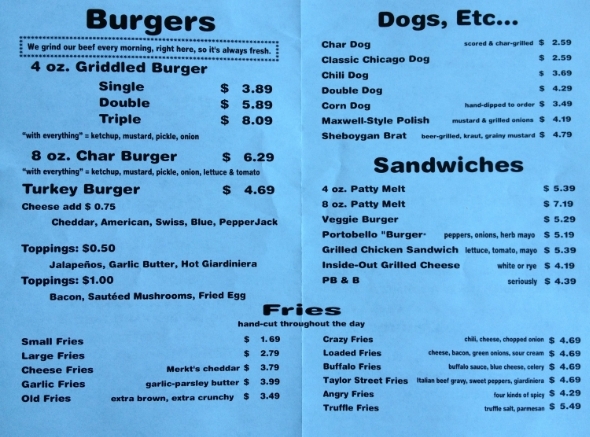 It’s a burger-lover’s dream because they clearly define the two types available. You can get it fried on a flat piece of steel, griddled; or you can get it heated on a grate over a flame, charred. It’s a rarity to be given this many options in a burger shop, and it’s certainly never so succinctly explained. What a great place for a date also. My wife can’t eat a whole eight ounce burger but she could certainly find something on the menu. I’m betting the four ounce griddled version would remind her of a classic burger joint she visited as a kid which served a quarter pounder fried in it’s own juices (probably better at Edzo’s, actually). Or she could get the grilled chicken if she was in a healthy mood. The shake was killer also and the fries looked great (thin-cut with skin-on). Maybe I’ll take her to Edzo’s for our anniversary. They’re opening one in Lincoln Park soon that will be a little different because they may not be able to offer the Char Burger. Good, that means I’ll be forced to try something new. Posted in food, tagged burgers on 2012/07/06 by John.